Most Etsy sellers I know have big dreams. You too right? Building that dream is a whole lot like a fantasy/adventure video game that requires players to reach certain levels and collect various achievements to continue on the quest. If you want to beat the game and go all the way, then the first key you need is perseverance. You simply have to become the most hard-headed “I will not give-up” fool you’ve ever seen. For the vast majority of us, there is no way to win without this essential key. There are other keys too, such as being great at customer service, learning how to price your products for profits, and getting great at social media. But in order to finally “beat the game” you are going to have to have the key of a recognized brand name. You can and should get started by piggy-backing off of the already established brand name of Etsy, but eventually YOU need a brand of your own. Truthfully, can you think of a single widely successful business of any type that doesn’t have a well known brand? The brand and the success go hand-in-hand. So at the risk of taking something that is really an art form in its own right and over-simplifying it, here are five easy and simple tips to start now on building your brand. 1. Get a decent logo! Use your logo everywhere! Put it on your shop banner, put it on labels or tags on your products, put it on your packaging, put it on your mailing labels, tattoo it on your arm! If you’re not skilled at graphic design, you can get a logo from another Etsy seller, or you can just go the route of finding a font you like and simply writing your name in a cool font. I like to use dafont.com because it lets you type in the words you want to look at. 2. A good name is worth more than Gold! You need a good name in two ways. First, you need a memorable name that makes people feel happy if possible. Second, you need a “good name” as-in a “good reputation”. You get this by taking care of customers, doing the right thing, and being consistent. It’s not a cakewalk. Your name should be in as many places as possible. I strongly suggest finding a name you can get the .com for, or if the owner of the .com is in a totally different industry then you could go for the .net, .co, or other but you really need a web domain of your own that matches your brand name. Very important down the road and owning the domain while you’re building the brand is insurance you won’t have to change your name and throw away years of effort. Trust me, we’ve learned the hard way! 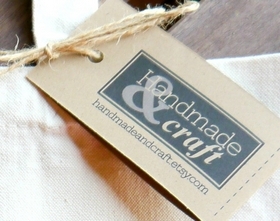 Here is a recent article about why Etsy sellers should have a website. 3. Use a branded email address. Kim has email addresses at lots of different websites we operate. When she first started her Handmade & Craft Etsy Shop, she used an email from RemodelingTherapy.com because the HandmadeandCraft.com site wasn’t set-up yet. We forgot about it and recently realized that all of her Etsy orders were showing buyers the email @RemodelingTherapy.com! Rookie mistake! Your email should always build your brand. The best way, IMHO, is to have the email @yourdomain.com but you could also go with yourbrand (at) gmail or yahoo or whatever. But your email address should always reinforce your brand. We use MadMimi for email marketing and even though we still (argh) haven’t gotten into the habit of regular sending, we at least know we need to and are planning in it! The absolute single most important factor to brand building is repetition. Just think of the injury lawyer in your town who advertises the most and you’ll see the power of repetition at work. MadMimi also integrates directly with your Etsy shop and allows you to pull your products straight into an email promotion. Thank you very much. Repetition works in many forms. 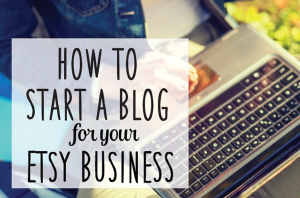 Email lists, blogging, and social media are all ways to “get your name out there”. But they shouldn’t replace advertising completely. Advertising is the most sure-fire way there is to get your name in front of people repeatedly. If done well, it can really work for you and unlike the aforementioned personal injury attorney, it doesn’t have to be annoying to work. It costs money to advertise and the results are hard to measure in short time. Pay-per-click advertising such as Google AdWords or CPM advertising on Etsy in the search results are the best for measuring short term returns. Brand building advertising on the other hand is more of a long-term investment and is usually visual and includes your name, your logo, and your products. Oh, and eh hem, we think EverythingEtsy.com is a great place to advertise! We have an email list for advertising sale announcements and we have a little (mid-term) ad sale coming up soon, so get on that list! 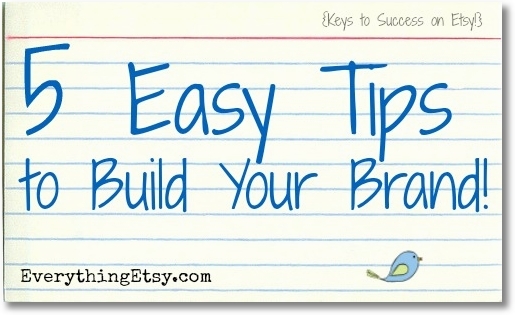 Here is a great Etsy video on Brand Building! What about you? Do you have any branding tips, learning experiences, or questions? The comments are open! Awesome advice on branding. Thanks! Great article with some excellent advice. My only disagreement is that I wouldn’t recommend paid advertising for Etsy. It’s incredibly hard to get right, and even when you do, the cost is often not worth the slight increase in views. Instead, focus on building your brand on social media. That does not mean only posting links to your listings (you know who you are!). 😉 Talk, connect, listen, make online friends. Get to know influential bloggers and press. Those efforts are often more effective than paid advertising, unless you have mega $$$ to spend. I disagree. I pay a mere $5 in advertising per week…. so $20 a month, and usually get about $200 in sales every month just from my search ads. I think that is pretty worth it if you ask me. Everything I have read at Etsy says you should never ever advertise by sending emails to your customers. So now what? Z- It looks like we’ve been reading from different books! Where did you read that? Email marketing is a funny thing. People often complain about it but everyone takes advantage of it on some level. You can hardly exist online without signing up to get emails from various services you use. If you only send emails to people who have either specifically signed-up and/or whom you’ve had a direct business transaction with in the recent past (six months or so) then you’re not spamming. Some people will probably unsubscribe from your email list (and providing that option is a requirement), and some people might even call your email spam, but that happens even with opt-in only email newsletters and blog subscriptions. It’s all about making your email useful to the people you’re sending it to. Just sending out something that says “Hey, buy from me again” is obviously not going to be well received. A good special, a new product, or a coupon might do much better. Here’s the other thing… what, exactly, do you have to lose by sending an email to a past customer? If they like you, the chances are that they won’t mind. If they don’t take the email well and they unsubscribe, what have you lost? You can’t take this to extremes. If you continue to email people who have asked to be removed then you can get into hot water. It’s officially illegal to “spam” anyone. But reasonable emails sent to actual customers seem like good business to me. 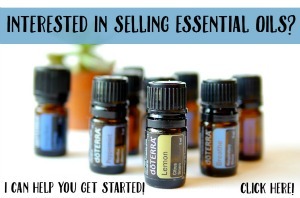 I’ve double checked the Etsy Dos and Don’ts and I couldn’t find anything saying emails are a no-no. If I’m wrong, please point me in the right direction so I can update my information!